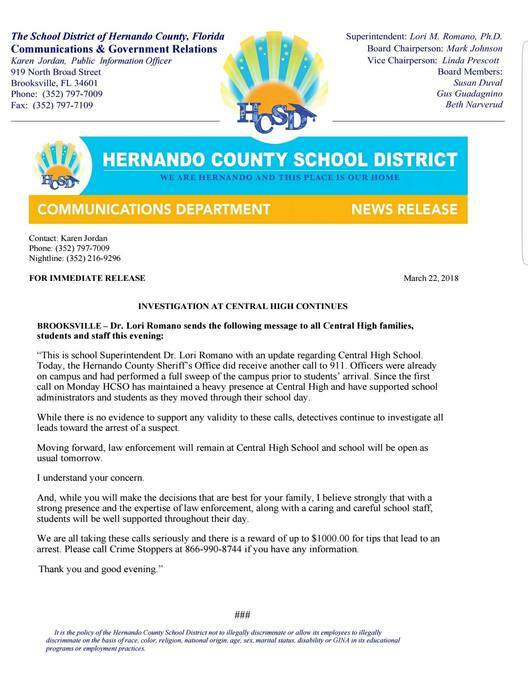 Only 10 percent of students reported to classes at Central High School and Endeavor Academy in Hernando County on Thursday morning. Those students were immediately placed on lockdown all of Thursday due to a sixth bomb threat in a matter of four days. A bomb threat was reportedly called in to 911 on Thursday morning. Frustrated parents reacted to the sixth bomb threat. "We’re afraid to send our son to school. We don’t know what's going to happen, is this a hoax? Or one day are we going to send him and something is going to happen?" said parent Wendy Palmer. The first two bomb threats were called in on Monday just minutes apart around 12:44 p.m. The third, Tuesday at 7:45 a.m. The 4th and 5th, Wednesday at 7:40 a.m., then again at 10:30 a.m. The 6th threat came in on Thursday before 7:50 a.m.
Hernando County Sheriff Al Nienhuis says they’re having trouble tracing the caller. "We are disappointed and surprised that we haven’t made an arrest yet. We had some good leads that we thought would pan out and we still feel that way," said Sheriff Al Nienhuis. Only 150 of the 1300 students at Central High came to school on Thursday. That's only about 10 percent of students. Kayla Dawson, one of those students, says she’s coming to school because she doesn’t want to give the person doing this more power. "People from other schools are probably like 'oh Central ha ha another bomb threat,' but it's more worrisome than you think it is," said Dawson. The first four bomb threats evacuated the school. The last two threats have put the school on lockdown as deputies scanned classrooms finding nothing. The school remained on lockdown all of Thursday. "The frustration level is about as much as it can be for everyone involved," said Nienhuis. The Hernando County Sheriff's Office says deputies and detectives are continuing to follow strong leads in the investigation into the bomb threats at the high school.